Slow-slip movement model showing direction of movement of GeoNet GPS sites and amount of displacement at the plate boundary. So far we’ve recorded 10-15 cm of movement at the red area. Slow-slip events are quite common in this part of New Zealand, due to the subducting Pacific Plate moving westward under the Australian Plate. We’ve recorded dozens of these events since we first detected them in 2002 after installing a GPS (Global Positioning System) network around New Zealand to monitor land movement. Slow-slip events (sometimes called silent earthquakes) are undetectable by both humans and our seismograph network because they move faults over weeks to months instead of within seconds like the earthquakes that you typically think of. Slow-slip events in this area tend to last around a few weeks, so this one is still in its early days. 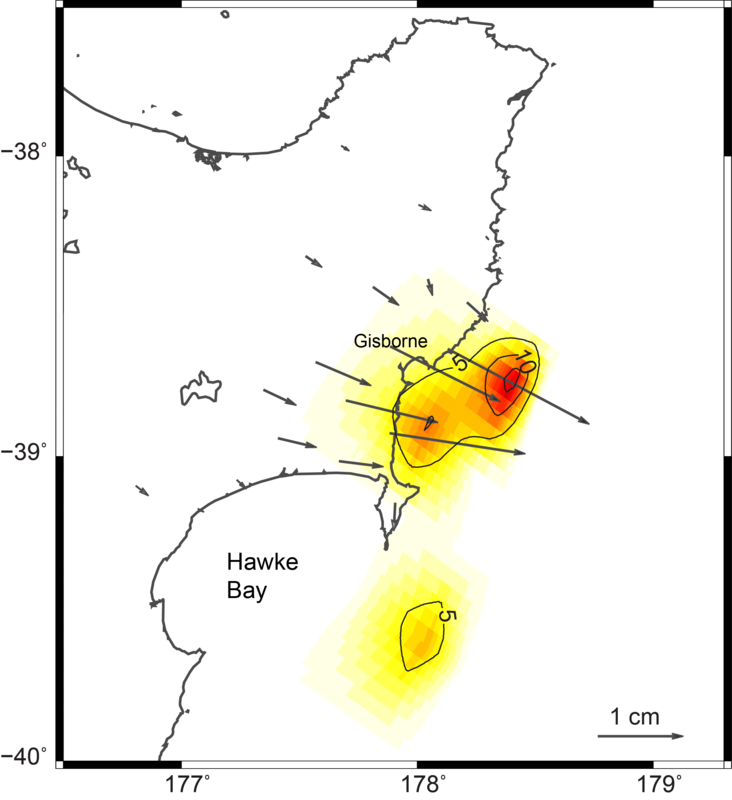 Scientists have so far recorded up to 3 cm of eastward displacement at GeoNet continuous GPS sites. This is caused by up to 10-15 cm of movement on the Hikurangi plate boundary offshore of Gisborne, as you can see from the model on the right. Our scientists have been anticipating this slow-slip event, as our slow-slip record has shown regular events every 1-2 years, and much larger events every 4-6 years. This event is on track to be as large as the biggest previous slow-slip event we recorded off Gisborne in March 2010. Because we know that this area has regular slow-slip events, our scientists have been studying this area for years. Right now, we have instruments out in on the seafloor off Poverty Bay that are waiting to capture the data from events like this. Our scientists can then study these land movements and changes offshore, to better understand the processes at subduction zones and the relationship of slow slip events to earthquakes. Slow-slip events are linked to an increase in localised earthquake activity, which we are seeing off the coast of Māhia Peninsula. Most of these quakes have been too small to feel. A similar sequence of earthquakes was observed during the March 2010 slow slip event. So what is a slow-slip event? As we mentioned earlier, slow-slip events are like earthquakes that instead of rupturing within about a minute, they can rupture over many weeks, and even up to years. This means that they are undetectable to humans and our seismometers, and they can only be picked up by monitoring the land movement by GPS. The best way to visualise what is happening is to watch this great video we made earlier this year. Remember that these are quite common in New Zealand, and our scientists have been anticipating this. We will keep you posted on how the slow-slip event unfolds. Like always, we would like to remind you to help keep you and your family safe by having an earthquake plan. Know what you should do in the event of a large earthquake, and if you feel a Long OR Strong earthquake, get to higher ground immediately. Dr Laura Wallace is a geophysicist with GNS Science. This post was originally published on geonet.org.nz under a CC BY 3.0 licence.